Ph.D. students Brianna Hendrickson and Alyssa Alsante sailed on the NASA-funded cruise from March 20 - April 13. Brianna Hendrickson, doctoral student in the Department of Atmospheric Sciences at Texas A&M University, and Alyssa Alsante, doctoral student in the Department of Oceanography, sailed aboard the R/V Atlantis for the North Atlantic Aerosols and Marine Ecosystems Study (NAAMES) March 20 - April 13. Both received the unique opportunity to join this research cruise through Dr. Sarah Brooks, Texas A&M atmospheric sciences professor. NAAMES is an interdisciplinary program investigating the major processes controlling the marine ecosystems and aerosols, funded by National Aeronautics and Space Administration (NASA). NAAMES focuses on the North Atlantic Ocean, where conspicuous plankton blooms occur annually. Those blooms make the regions an excellent test region to resolve the linkages between marine plankton, aerosols, and climate variabilities – based on combination of ship-based, airborne and remote sensing measurements, Hendrickson and Alsante said. 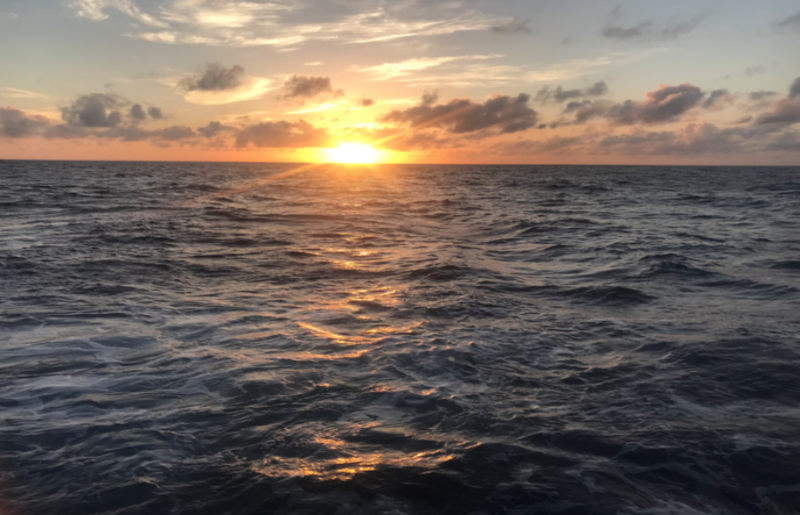 Four different cruises were conducted annually for each NAAMES campaign during different seasons, and the cruise both Hendrickson and Alsante participated in was a part of the spring season. The cruise started in San Juan, Puetro Rico, and ended in Woods Hole, Massachusetts. Along with more than 30 other researchers, Hendrickson and Alsante represented Texas A&M on the cruise. “The main research goal of NAAMES was to understand the processes associated with the annual phytoplankton cycle and marine aerosol production in the North Atlantic and the implications on climate,” said Alsante. Aerosols are liquid droplets and fine solid particles suspended in the atmosphere. The majority of aerosol are consisted of mineral dust and sea salt but also includes other particles, such as volcanic ash, sulfate, nitrate, and organic carbon. This complex group of particles act as cloud condensation nuclei (CCN) and ice nucleating particles (INP), which affect the formation, growth and lifetime of clouds in the atmosphere. Clouds alter the Earth’s heat balance through scattering and absorption of sunlight, and hence, the climate of the Earth. During the cruise, Hendrickson collected and measured marine aerosol particles related to cloud formation using a ‘CCN counter’ instrument. Her main goal was to assess the impact of phytoplankton processes on the climate by understanding aerosol and cloud production. Alsante collected filters containing aerosols, which were returned to the laboratory at Texas A&M University for further analysis. Of particular interest is the potential for aerosol to act as Ice Nucleating Particles (INP), causing water droplets to freeze at warmer temperatures than that of pure water in the atmosphere. Efficient INP are essential for the formation of clouds containing ice. She also participated in collecting ambient cloud condensation nuclei (CCN) measurements to look at the number of particles that activate and grow to cloud droplet size. INP and CCN measurements were taken continuously throughout the entire cruise. 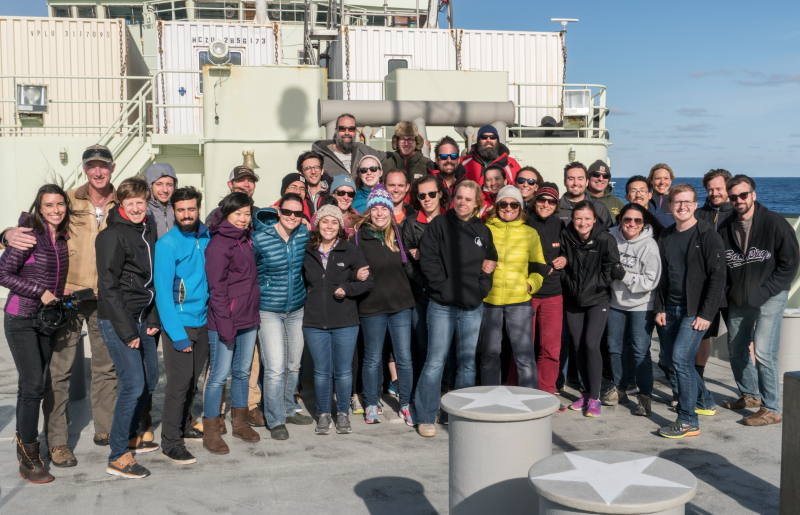 In addition, Alsante and Hendrickson were in charge of collecting samples from the sea surface microlayer for many research groups on the cruise. For more information about NAAMES, visit the official website.